Use your circular template to round one corner. The fabric you want on the top and bottom of your sock will have the top let corner rounded, the fabric for the middle part will have the top right corner rounded. Iron the interfacing onto your 'top' fabric, in this case the pink. Cut the corner to size if you haven't already (I prefer to iron the interfacing on first before I cut it exactly to size). Don't sew all the way through! Mind the gap. And 'fray' the rounded corner. This will help getting the curve into shape properly. Make sure you get all the corners are square as you can, and the curve as round as you can. Press the fabric in the gap for easy sewing. Close the gap. This side will be hidden so if the line is not perfect no one will notice. Place the fabric on your ironing board with your chosen 'top colour' facing up. Fold the top right-hand corner over to where the curve on the left starts. Fold the bottom left-hand corner tightly over to the other side. Fold the remaining corner back onto itself, finishing the sock. Cut about 7 inches of cord and choose your beads. The length of the cord already incorporates the knot that you will make. Make a knot on one end of the cord. String both beads onto the cord. Make a second knot at the other end of the cord. Your result should look like this. Fold the sock open, and hand sew the cord with the beads onto the sock, about an inch above the lowest point into the centre part between the folds. I normally just loop the thread around it a few times and once or twice through the cord the ensure it stays put. Try to keep the stitches fairly close to each other as you will see these on the back. Once you have sewn on the cord with the beads, refold the sock. Using a matching thread, hand stitch the sides of the sock together. Start with the longest side by hiding the knot of your thread on the inside of the fold. I use an overcast stitch to do this. I like the result it gives as a running stitch would be too hard on this. Sew all the way down until you read the cord. Cut 5 inches of ribbon and get your button ready. 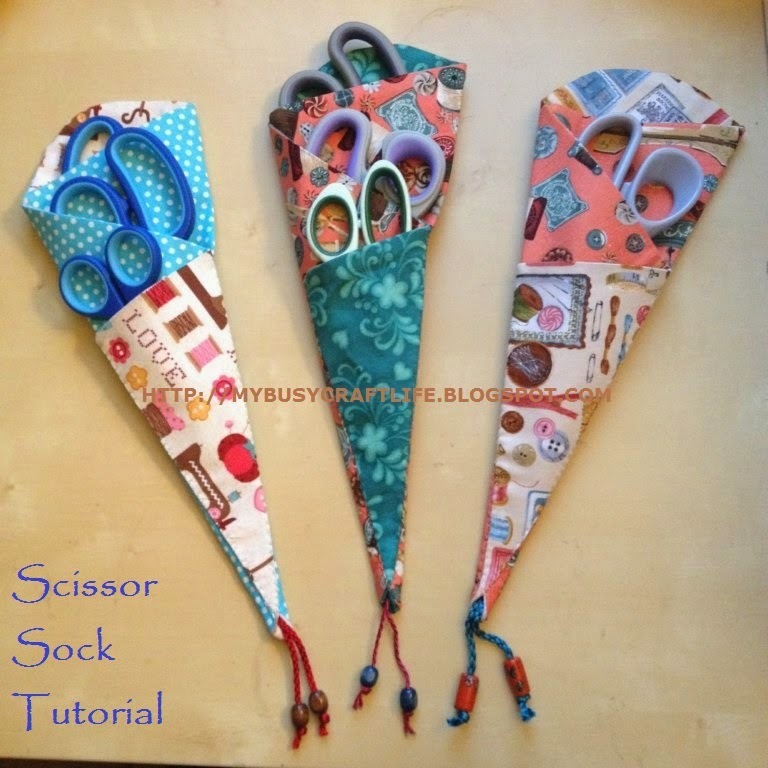 Fold the ribbon and sew it onto the middle top part of the sock, about an inch from the top. Sew the button on top of the ribbon, hiding any ribbon ends. Your finished sock will look like this. LOVE these little socks MJ - such a great idea, and lovely clear tutorial too! Super cute! Love the idea and the fabrics you used! Thanks for sharing! That's pretty cute! Thanks so much for linking!